This is the new addition to the two million bestselling range. In Bodyweight Strength Training Anatomy, author and renowned trainer Bret Contreras has created the authoritative resource for increasing total body strength without the need for free weights, fitness machines or even a gym. Going far beyond standard pull-ups, push-ups and squats, Bodyweight Strength Training Anatomy presents 156 innovative exercises that work every muscle in the body. Each exercise includes step-by-step instructions demonstrating proper technique and more than 170 full-colour anatomical illustrations depict muscles in action and point out which ones are being engaged. 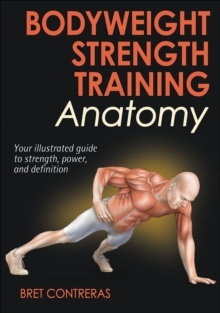 This book is part of Human Kinetics' bestselling Anatomy Series that has sold more than two million copies.